I feel like I should preface this post by saying that I’m not positive how it’ll all tie together or if it’ll even make sense, but it has been on my mind and I wanted to share. 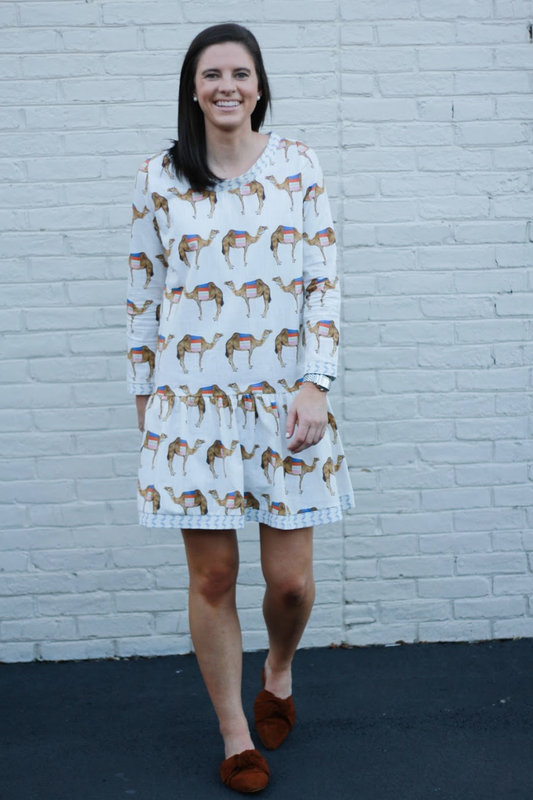 When I got this dress, I couldn’t stop thinking about the commercial that talks about being “Happier than a camel on hump day.” This dress is one of those pieces that I put on and immediately feel more excited about my day. I wore it to work the other day and got so many questions about where I found it. If you didn’t catch my post about Brooke Wright Designs in this post then you may not recognize the style of it, but it’s the same style as the Rebecca shirt I wore in that post (and gave away on my Instagram) in dress form. At this point it probably comes as no surprise that I’m drawn to just about anything with a peplum hem and this dress was clearly no different. 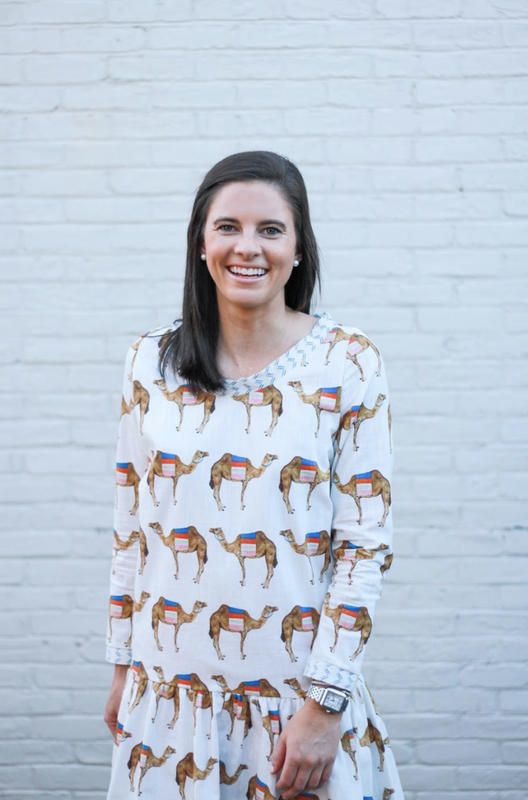 When I saw the camel print and long sleeves I decided it would be the perfect fall dress for weekends and workwear. 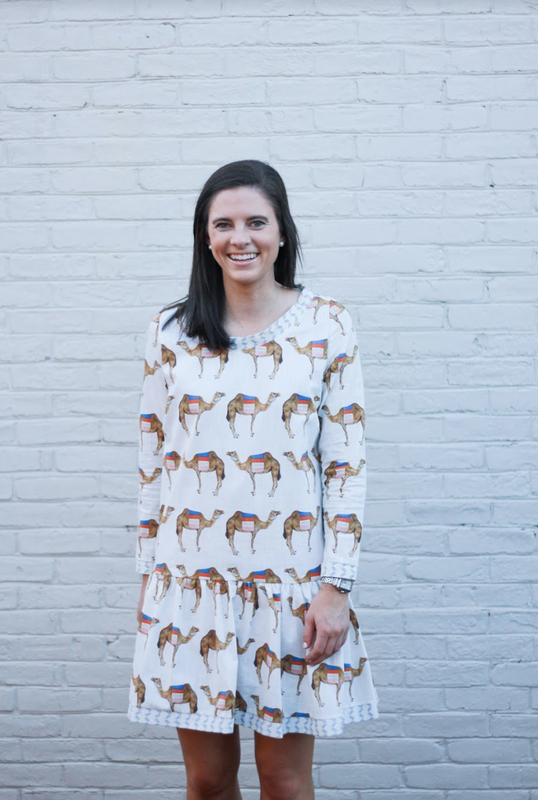 I will gladly attest to the fact that looking down and seeing camels on your dress quickly boosts your mood and makes you feel happy. Speaking of happiness, it’s something I’ve wanted to address over the past couple of weeks but didn’t really know how I wanted to articulate my thoughts. One of the weirdest things I noticed after making the decision to stop teaching and eventually sharing that with y’all as well was the number of people who messaged, commented, emailed, or even told me in person how much more relaxed I seemed. My grandparents brought it up at the beach one weekend to my parents while people who even just follow me on Instagram would message me with that same observation. While I mentally knew that I was less stressed I didn’t feel like I was necessarily acting any differently since I tend to bottle that sort of thing up and attempt to keep it to myself. My roommate, Rebecca, went through a similar experience when she decided to make the move to Birmingham as well and said that people told her the same thing even though she felt like she hadn’t necessarily changed the way she had been acting too. Fast forward a little bit to being in Birmingham for a week or two and the same sort of conversations being had about how much happier I seem. This time though, I noticed it too. After calling my parents one weekend and updating them on what I had been up to they both independently said something along the lines of “I’m so happy to hear you so happy” and “It’s so nice to have such happy conversations with you.” It seems like every time we talk I bring up how happy I am, and they notice it just in the way I’m talking about what I’ve been up to and life in general. Other people’s awareness of my happiness and stress levels caused me to think back about the past year and teaching. While I knew that I didn’t want to continue to teach and had some very rough/stressful days, I don’t think I was necessarily unhappy all the time but instead not fully experiencing the happiness that I have in the past month. I certainly miss Greenville and the group of friends I had their who I should probably thank for making it so that I wasn’t entirely unhappy this past year. But having gone through that and becoming more cognizant of how happy I am currently has finally made me understand what people meant when they would tell me that they were “proud” of me for making the tough decision not to teach. In my mind when people would tell me they were proud of me for that I would always get a little bit confused. As a perfectionist my mentality of what it sounded like to others when I told them that I was changing directions altogether was that I was quitting a perfectly reasonable job without having something else lined up which seems like a huge risk. This is full proof that I am my own worst critic since instead these people were able to realize that I wasn’t as I could be. Why I put a different perspective behind a simple comment about being proud of me for taking that risk is beyond me (thinking I should take a class about how to take a compliment better) but makes more sense now. Although I’ve only been in a new place with a new job for about a month I can honestly say that taking a risk has been so worth it especially in regard to my happiness. I wake up each morning excited to head to work and see what the day will hold as opposed to having a knot in my stomach with anxiety about what could happen. I’ve embraced change more whole-heartedly than I ever had and was relatively calm (but let’s be honest there were some moments where I wasn’t) about not necessarily having a plan for what was next. I will say that having familiar people here in Birmingham (hey Nell, Rebecca, and Macy) has definitely made my transition easier. It has been nice to not have to start entirely from scratch and instead form connections with people in the area through one another.